Incorporating a wood stove into your life can bring you all the pleasures of a real fire, from effective heating to comfort and coziness. Purchasing a wood stove can be a little tricky as you need to understand the materials, the technology, and the fuel that are going to work best for you. While wood stoves are energy efficient and eco-friendly, researching stoves will help you find one with a good burning capacity, reducing the cost of heating and providing all the warmth you need. Nowadays, there are two main types of wood stoves: catalytic and non-catalytic. Catalytic wood stoves have a smoky exhaust that passes through a honeycomb made of ceramic, and that sits inside the stove. The smoke gasses and particles produced in the stove are ignited and burned through the exhaust. They help to combat smoke emissions and tend to reduce them by half of those produced by no-catalytic wood stoves. Non-catalytic wood stoves do not use a catalyst to burn off the smoke and particles produced in the stove. They have alternative methods used to encourage complete combustion instead. Firstly, there is firebox insulation and a long baffle which produces longer and hotter paths of gas flow. The preheated combustion air is introduced through holes above the fuel, situated in the firebox. These mechanisms encourage smoother combustion with enough oxygen to prevent large amounts of smoke and soot buildup. Traditionally, wood stoves didn’t use to have these mechanisms. They worked with flues to control the combustion, making them far less efficient, producing more smoke and pollution. You can also find pellet stoves which are fuel by small pellets of compressed wood or biomass pellets. 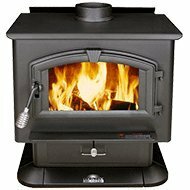 Like all heating solutions, sourcing a wood stove for your requirements means understanding your needs. Firstly, it is important to consider the type of wood stove you are looking for. While catalytic stoves appear to complete combustion more efficiently and tend to have a better heat output, they can degrade quite quickly if you burn anything that isn’t natural wood. Non-catalytic stoves tend to have a beautiful aesthetics and are a little more durable. The size of your stove is important as it needs to be in relation to the room you are heating. Generally, wood burning stoves can heat between 1000 and 3000 square feet. However they can be quite large, so you need to consider the physical space where you are going to place the wood stove. Equally, the size of the firebox will result in how often you have to tend to the fire, with bigger fireboxes being able to hold more fuel at a time. The cost and maintenance are also important to consider. The outlay for a stove can be between $1000 and $3000. Included in the costs is the type of fuel you’ll be burning. Wood pellets are of course more expensive than burning your own wood, and the delivery plus shipping fees can cost between $150 and $300. In terms of maintenance, consider how to remove the ash and clean the stove; removal ashtrays are far easier to work with.. Cost is also dependent on the efficacy of your stove. Regarding this, the fuel used in the stove will affect the efficiency. Furthermore, stove lined with firebrick are more energy efficient as they are better insulated. Try to look for EPA certified stoves as they are energetically efficient. Wood stoves bring around a variety of benefits. Firstly, they create a beautiful level of comfort and hominess in a room. In terms of environmental considerations, wood stoves are more environmentally friendly, using a renewable energy source. Gas is not renewable and electricity tends to be run on non-renewable resources. Equally for those situated in more rural areas, you can supply your own fuel. They also tend to be more energy efficient over time. In this sense, wood stoves, despite their initial high cost, can be far cheaper to run than other types of heating. They decrease your monthly bills quite considerably. When it comes to convenience, wood stoves can be especially useful in areas that have an intermittent power supply. If you are relying on electricity for heat and cooking, it can get very cold if the electricity shuts off. Wood stoves work independently and don’t rely on unreliable grids. 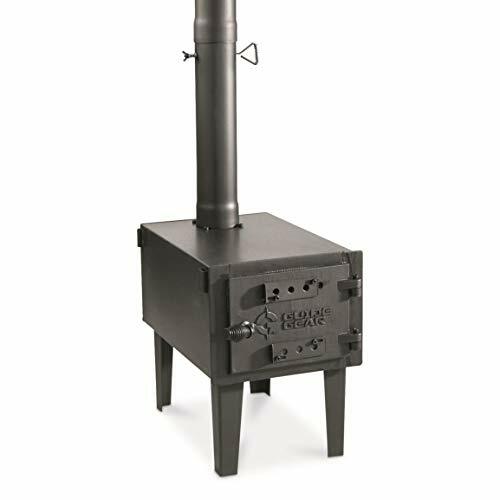 Purchasing a wood stove can be an endeavor, however, here are a few suggestions of some of the best models on the market, and how they perform. Made from galvanized steel with a high-temperature finish, this stove is for outdoor use only. The firebox is 11.75w. x 16.25d. x 10.75h., and features 2mm thick insulation. It has detachable legs and can be packed away inside itself. It gives out good warmth for smaller spaces. All components are detachable making it very easy to pack away. It is very durable and can withstand high heats without compromising the materials. The stove is quite small and therefore can’t heat large spaces. It can only be used outside and isn’t EPA certified for indoor use. The door latch is too small and there is no seal so it loses a bit of heat. 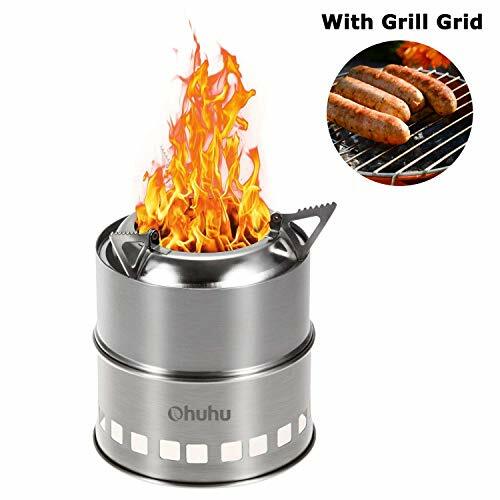 It is predominantly an outdoor stove and is great for heating patios. It’s very portable, but you may need to add a door seal. 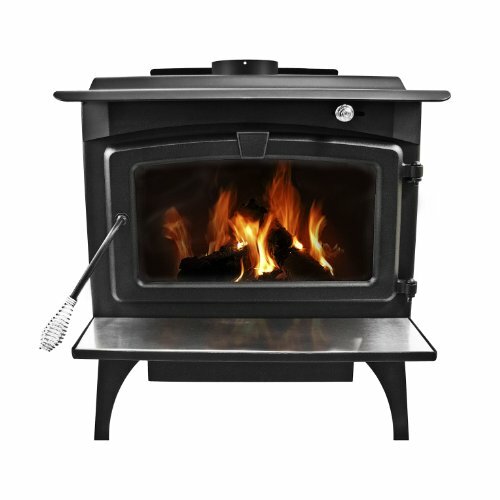 This EPA certified clean burning stove heats up to 2000 square feet and has a 21-inch log capacity. There is an ash drawer included and a blower. It is made of plated steel and is lined with firebrick. It burns very little wood due to its high efficiency. It is easy to light and gets hot within 10-15 minutes. The blower allows the air to circulate more effectively. The firebrick provides excellent insulation preventing poor combustion and loss of heat. The fan can be a little loud, especially on the lower settings. The ash drawer is very slow, and therefore shoveling the ash is a far easier method of removal. This heater is a great way to heat a larger space, with a blower that helps to dissipate the heat. It works very quickly, however, it produces a lot of ash, that the tray can’t handle, so you will need to shovel it out periodically. This portable wood stove is lightweight and eco-friendly. It has secondary combustion for high thermal efficiency. It folds away into a small storage bag. It is very energy efficient due to the secondary combustion. The pot supports are very sturdy and can hold a cast iron skillet. It is made from double-walled stainless steel making it very durable. It is very compact and lightweight and can be packed into a backpack easily. It is not designed to be used indoors. It is not designed as a heater but more as a cooking stove, so heat doesn’t distribute outwards well. It is more of a cooking stove than a heating stove. However, it is energy efficient and produces a good amount of heat for such a small device. 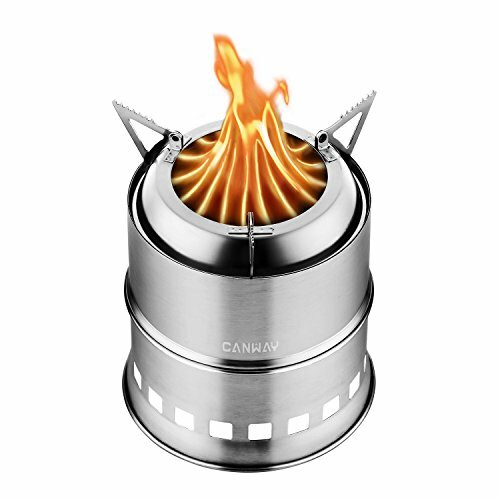 Made from stainless steel, this compact camping stove is very lightweight. It has a three-arm base for holding pots and is equipped to burn twigs, leaves, and pinecones. Working as a rocket stove, it is very fuel efficient. The arms are very sturdy and can hold quite heavy pots. It has a good air flow system, meaning it gets hot very quickly. It is compact and lightweight, folding easily into an easy travel bag. It leaves a fire scar on the ground so it cannot be used on a table. This is also not designed for indoor heating, however it gives out quite a bit of heat for outdoor camping. This stove is a very efficient cooking stove powered by wood. Surprisingly efficacious, for such a small stove, it folds away easily, being portable. It isn’t predominantly designed to be a heater and doesn’t heat an area very well. This non-catalytic wood stove is EPA certified and heats an area of up to 1200 square feet with 6-8 hours of burning from one fuelling. It includes a variable speed blower, ash wash system, and a ceramic glass window. The variable blower pushes the heat evenly around the room. It is very energy efficient and doesn’t need to be refueled constantly. The ceramic glass window gives a homey feel as the flames are visible. It gives out a great deal of heat and can actually heat rooms up to 2500 square feet. It cannot maintain a fire overnight. The firebox is quite shallow so you can´t place large logs inside. It needs curing the first 3-5 times you use it as it has a very unusual smell. This heater is great for heating large spaces and is very energy efficient. However, it doesn’t keep a fire burning overnight and is a little shallow. Wood stoves are a great addition to any home, inside or out. They give the warmly feel of comfort from a real fire. Equally, they are very energy efficient, use eco-friendly fuel, and use convection, direct, and radiation heat. Remember to measure the space you are putting it in, as some of them can be quite big and might need space around them so as not to pose a fire risk. If you are looking to increase the efficiency of your stove, then we would consider looking into wood stove fans.